The Dao De Jing describes the way of yin, the feminine, as being ‘water’ and that of the complementing yang, masculine, as fire. In Daoist terms there has recently been a shift in the internal energies in both sexes, resulting in women now having too much fire. The water-based nature of women has been forgotten and they can no longer express this innate way of their being. Unfortunately this has a negative impact on mankind as a whole. Without the true influence of the feminine the world is becoming more volatile; like a fire burning out of control. Only women have the power to quench the fire of the masculine. Therefore women must find their way back to the water and to the true seat of their power. An excess of fire in women manifests mainly in the following symptoms. A deficiency in water will express itself through emotions, behaviour and through one’s contact with the daily environment. For example, perhaps I hear I am being accused of something I did not do in my workplace. The general response to this is to become worried, angry, upset and eventually confrontational. The fire will take me through many emotions very quickly, causing exhaustion in the process. My mind runs a hundred scenarios over how this has happened and I will become angry with the people involved and afraid of the outcome. I will justify and feed my anger by endlessly going over the situation internally. I will disturb myself and those around me by acting from these feelings. This response comes from the fire. A response from water allows me to act differently. First of all I am flexible to the day unfolding differently that it has before. I am patient and wait, keeping busy until something in the situation changes and requires my attention. When I do have the opportunity to explain my side and listen to the other I am gentle and in control, and firm if necessary. Whatever happens, I retain my power, my centre. I do not waste energy being disturbed or causing negativity in myself or in my relationship to the workplace. I let go of controlling the situation, and as a result free myself from the control of an overactive mind. The modern view of women being ‘equal’ to men does not mean that they are the same. Women and men are equal in value, but their natures are far from being identical. In Daoist teachings the words translated describing the feminine are often ‘submissive’, ‘soft’, ‘yielding’ and ‘receptive’. The word ‘submissive’ is always unacceptable to women in the west, but in this context it does not refer to submitting to the power of men. Instead it is the act of willingly submitting to the dao - relinquishing the need to control the world and instead following the flow of arising conditions. Water in its earthly form has unpredictable and free movements with no jarring actions, no conflict. It flows around, over and through obstacles while nurturing and changing its environment. This is the natural disposition of women, yet it is the opposite of how many conduct themselves today. Reuniting with the water-self does not determine that all women should be inactive, quiet and shy. It is independent of character and personality and surpasses the ‘black and white’ nature of our current society. The most vivacious, outgoing and determined woman can still be yielding. She can be strong and still be submissive. She can surrender to the changes in her surroundings without losing her power or potency. What can stop the flow of a river? It has a subtle and invisible but continuous strength. It is capable of being gentle and soothing, or an awesome spectacle which all give way to. When the river submits to being confined in a narrow gully it does not relinquish its power, only makes its way through, gradually eroding the surroundings to be more comfortable for its flow. This is the way of a woman. Persuasive, influential, flexible. Aware of the subtlety of her power and the deep enjoyment that comes of using it wisely. After centuries of habit it may seem like an impossible task to become water. But as we become conscious of a choice in our way of being, we find that living in the water is much easier than a life in fire. There is an effortlessness, a growth of energy both physical and spiritual, and a life that feels more manageable and less overwhelming. 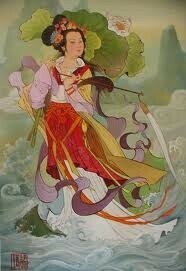 In Daoism both sexes are advised to learn the way of water. Women are just very lucky that if they allow it, it comes naturally.